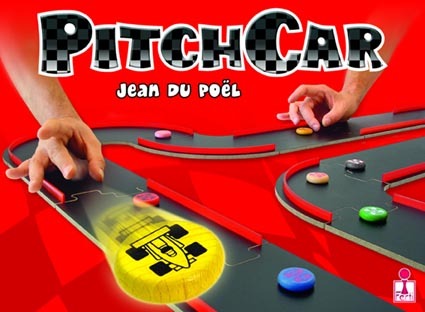 The day before Rails Rumble, I picked up a copy of PitchCar - a dexterity racing game in which you're flicking little wooden discs around a track made of wooden tiles that fit together like puzzle pieces. The game came out in 1995 which, as hard as it is for me to believe, was 20 years ago, so it's getting hard to find. Add in the fact that the "cars" and the several linear feet of track are all made out of wood and PitchCar isn't very cheap. There's a smaller version, PitchCar Mini, which is a little more affordable and a little more readily available, if you wanted to go that route. Even the base version of full-size PitchCar needs a fairly large table for some of the track configurations, so the smaller version would work well if you had either size or money constraints. However, I wanted the full-size experience, so I splurged and bought a copy from Amazon, with free shipping - all in all, a good deal, given the weight of the box and the scarce availability of new copies of the game (at least in the US). One of the main reasons I wanted to get this game was to play it with Kiera, who really enjoys playing Crokinole and beats me at almost every game we play. We were both really excited when it came in and gave it a try that night after dinner. The first time we played it, I was a little let down. The quality of the components is great, but the track didn't seem as fast as I had hoped it would be and slowly going around the track is kind of boring. We played two races and called it a night. We both enjoyed the game, but not nearly as much as we had expected to. Tonight we gave it another go and it was much better. First of all, before we played, I wiped down the track pieces and the discs with a soft cloth and a bit of furniture polish. Second, we built a track with many more curves and strategically placed guardrails to allow for a lot of ricocheting around the racetrack. The track was fast, the trick shots were many. We'd both had a little experience on what to expect and what to do and Kiera and I were both really into it. We had a great time. Next time we'll play two cars each and start a circuit, scoring points over the course of a series of races. We're both really looking forward to tight curves, hairpin turns, and most of all the jump that's included in the expansion. I'm really glad we got it and glad we gave it another go. Much fun was had and many more fun races will be played. I'm not sure what happened that first time. Maybe we were expecting too much.